The input board is a small PCB mounted directly on the connector. The main CPU board is mounted directly on the display. If you are from Denmark ! read the Danish version !! The extra input B is for a later SWR brigde project, also the TX serial output will be in use later. Input SWR vill varry from 1.00 to 1.30, depending on input frequency. 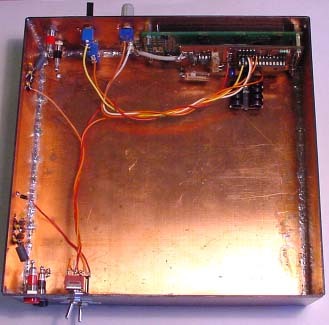 To make the SWR this good, you need to assemble the input circuit correct and adjust the capasitor. Input power range: -60 to +30dBm that is 1 nW to 1 Watt. A software routine can calibrate the 0dBm point at 5 different frequencies to make this instrument accurate within 0.5dBm !! The calibration data is stored in EEPROM so the instrument will remember all, also without power. The display, shows dBm from -60 to +30dBm, RF Voltage and RF Power and Bargraph in 1db step. Also I must complement the POWERTIP display for it's exelent contrast and viewing angle and low prize ! I use a POWERTIP display with 20 caracters in 2 lines with LED light. The cabinet is homemade of glasfiber PCB, easy and cheap to construct. so that it's hard to come in and make modifications. note the RF filter on the DC voltage input. 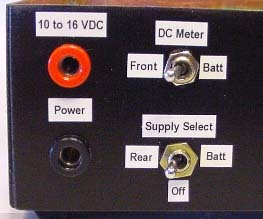 The DC voltmeter switch is connected so that it's only possible to measure the battery voltage when it's running on battery. Here is how I have connected the two switches, the charge resistor and diode needs to be adjusted to fit the used battery. If no battery supply is needed, only one switch is then mounted. 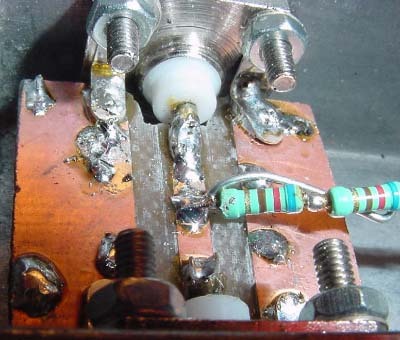 Note the diode and little-fuse for reverse polarity protection. The AD8307 is SMD SO-8, the extra input board is for a later project (SWR bridge), more about this next year. The TX serial out pin is for several future projects, that uses a PC to draw curves and more. But you can calibrate at your own favorite frequencies for best performance. In the RF-powermeter screen, use the SELECT button the enter RELATIVE mode. In this mode dBm and bar-graf is shown, when entering this mode the dB read out is zero'ed. at the right setting use SELECT to activate, this is also shown in the display. 0: 0dB, no attenuator is mounted 1W max. ! 1: -10dB attenuator is mounted, 10W max. ! 2: -20dB attenuator is mounted, 100W max. ! 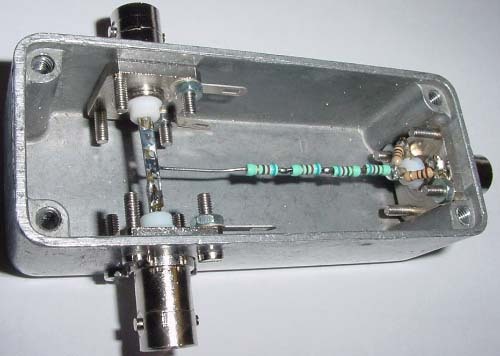 3: -30dB attenuator is mounted, 1kW max. ! 4: -40dB attenuator is mounted, 10kW max. ! 5: -50dB attenuator is mounted, 100kW max. ! 7: RF Powermeter, the default startup screen. 9: Help Info, a small users guide is also build in. 10: About Info, shows software version and so on. The DC voltmeter can measure from 0 to 20 volt only positive, with a resolution of 20mV. Nothing is burned if input is reversed, it just can not measure ! Calibration is done in hardware: use one or two 10meg resistors to parallel R28 or R18 until correct voltage is shown. but remember the input impedance is about 80 kOhm. The digital-powermeter input range is 1nW to 1W. 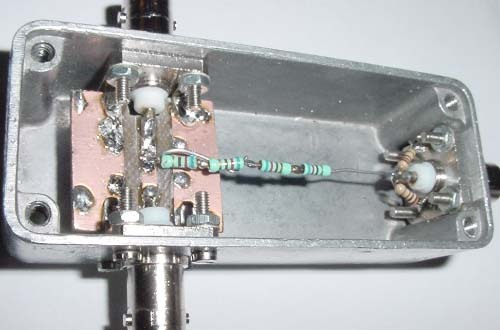 To measure more power an attenuator can be mounted in front of it, but they are expensive ! A good and cheap solution is to use a -40 dB tab. 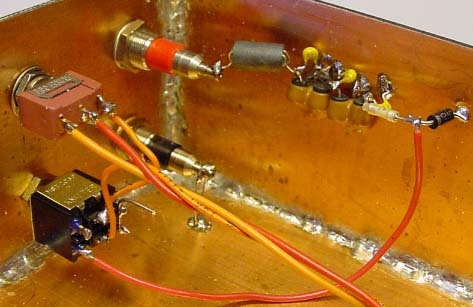 Here is my simple homemade -40dB tap, using 3 BNC connectors a small cheap box and a few resistors. The four first resistors is 620 Ohm each the bottom resistors is two 100 Ohm in parallel. The 2.7mm stripline needs to be verry acurate, the PCB is double sided 1.6mm thick. Power in the resistors: I use 250 mW resistors * 4 = 1 Watt the power in the bottom resistors is negible..
the resistors can stand the double power for about 1 minute and 4 times a few sec, so to my needs this is fine.